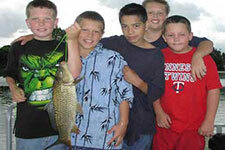 Minnesotans have a unique opportunity to get outdoors and enjoy aquatic habitats. There are more than 5,400 game fish lakes in Minnesota and 18,000 miles of fishable streams and rivers. Fishing is a lifelong activity that connects participants with their local environment and encourages stewardship of natural resources. MinnAqua education specialists can help your organization develop or improve education programs that promote fishing recreation and aquatic conservation. Contact MinnAqua for more information. During summer 2017, interns will lead fishing and aquatic education programs at the following Minnesota State Parks: Forestville Mystery Cave, Fort Snelling, Itasca, Jay Cooke, St. Croix, Sibley, Tettegouche, Whitewater and Wild River. For program questions or schedules, contact the park directly. Our Fishing: Get in the Habitat! 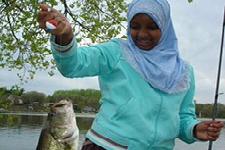 leader’s guide helps you introduce kids to fishing, address Minnesota academic standards and engage kids with learning that is relevant, interdisciplinary and fun! The MinnAqua leader’s guide has 39 detailed, beautifully illustrated fishing and aquatic education lessons and activities. You can also download full curriculum or lessons. To request a hard copy of a sample lesson and invertebrate identification key from the Leader's Guide, please email Cassandra Hawkenson.